Last spring the boyfriend and I joined Matzo and her partner (now husband) at their house for some good old fashioned grilling out. Now Matzo is a whiz with the grill. Even if I didn’t live in a third floor walk-up with no porch or balcony (or one that would not catch on fire), I imagine I’d be no Houdini with the grill. At this grill out I brought over a package of pork ribs as my offering and Matzo did her magic and made some of the most amazing grilled meat I’ve ever had. Part of the magic was due to the bicentennial spice rub she had from Chicago’s Spice House. 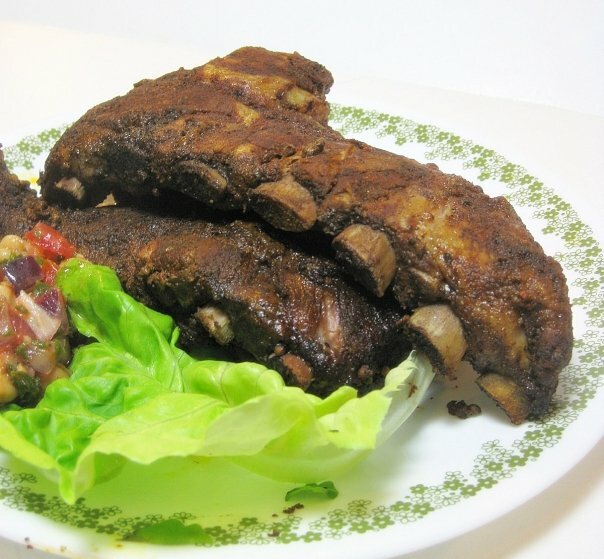 A mixture of Americana and goodness, it gave the ribs a fantastic, complex flavor. Of course, me being me, I had to figure out how to replicate it at home. It ain't pretty, but it's quite tasty. While Matzo put some BBQ sauce on those delicious ribs of that fine spring day, when I decided to make this at home I wanted to go sans sauce, a (perhaps) misguided attempt at eating “lighter,” especially since I wasn’t in the mood to make my own BBQ sauce, as I’m getting snobbier in my old age and am trying to stay away from anything with high fructose corn syrup.